MT. JULIET, Tenn. (WTVF) — Heath Scott owns 7 Point Farm & Apothecary off Mt. Juliet. The business located at 10425 Lebanon Road is the area's first seed-to-table hemp operation. Every product sold he grew on his farm. "To know where the products come from is important. It's how it was grown. A lot of people don't get to see that or have that opportunity. They just get it shipped from another state," he said. He sells a variety of hemp-infused products including oils, products to smoke, pet treats. He said he plans to offer hemp-infused coffee and ice cream starting March 1st. "I'm really good with plants. Bringing this concept to help people that it helps. People could possibly fail a drug test, there are goods and bads, some people it helps, some people it don't. It's not a miracle cure by any means but it does help some people. Everything that you see here is set up for a person who does not know a lot about it that way they can be educated about the products," Scott said. As Scott talks to customers, it's clear he'd rather educate them than make a quick buck on his products. On Friday, customers walked in to get help with joint pain like sciatica and anxiety. "There's children with seizures that have seizures every day that don't have the ability to get the product or medication that they need because our state. This is the closest thing that gives them CBDs that are legitimate and legal in this state. It's an alternative but not the same like medical marijuana," Scott said. 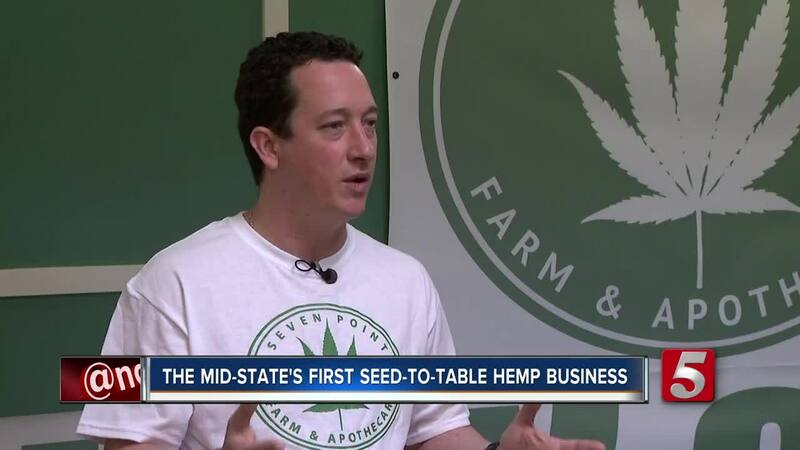 Scott wants the public to see the benefits of industrial hemp business. His products are legal in Tennessee because they have less than 0.3-percent THC - the ingredient in marijuana which causes someone to get high. "It don't help everybody but the healing potential in CBD is just as great as that of THC," he said. Scott also offers lab testing and has a greenhouse on his property. It's a one-stop shop.